As a community thousands of people from Acadiana came together at workshops open to the public. 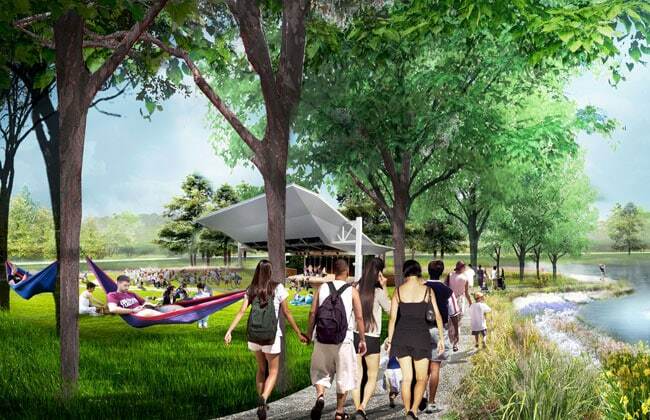 In 2013 and 2014, we dreamed, we shared our ideas, and hoped our park would be. The year 2017, marks the start of our dreams coming true, as we break ground to build our world-class park. 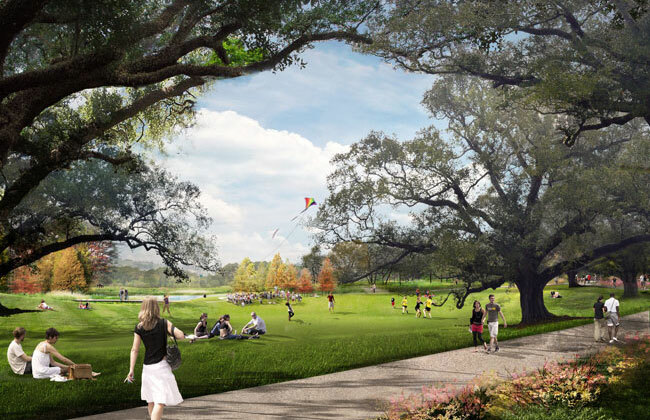 It’s Here … a World-Class Central Park for all of Acadiana! An oasis of serenity begins the moment you depart the hustle and bustle of Johnston Street, and wind your way through the sanctuary of brightly colored flowers and splendid trees. Your stress will melt away as you are greeted with native Louisiana plants that burst with color year-round. You will be embraced by the peaceful shade cast from tall pine trees and majestic live oaks whose sweeping limbs are truly emblems of our southern home. Should you arrive by foot, bike, or car, beauty awaits and abounds. Nestled under the oaks near the entrance to Moncus Park, the Lafayette Farmers and Artisans Market continues to delight Saturday morning shoppers. As we approach the edge of the market, we are treated to the grand view of the great lawn, host to brides and grooms, family picnics, and children running in the open green space. 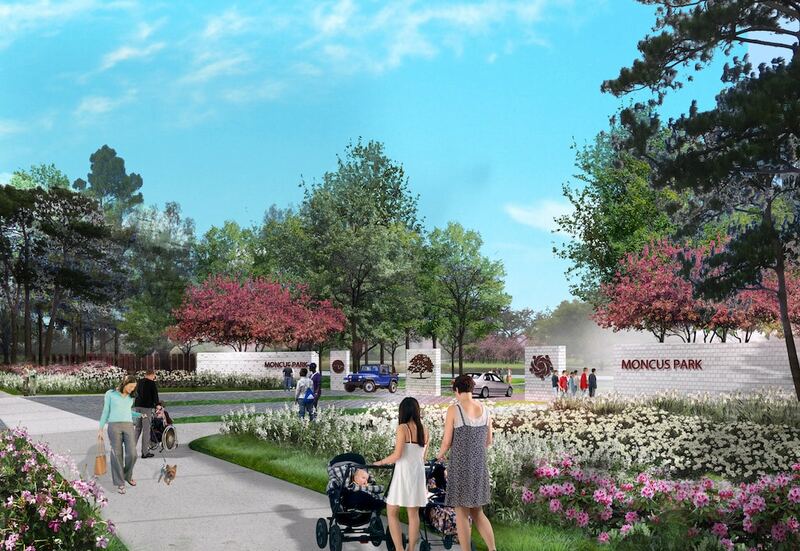 Just across the way, dogs play fetch with their humans in the dog park, families enjoy the Inclusive Playground, and children frolic in a Louisiana-themed splash pad. Take a peaceful stroll on the wetland boardwalks and enjoy the beauty of one of our region’s most diverse ecosystems. 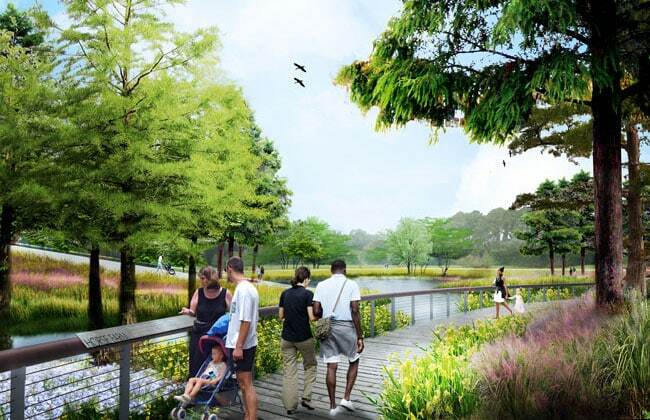 Providing expansive views across a wetland pond and quiet places of reflection, the boardwalks traverse beautiful arrays of wetland plantings and open water. Educational signage teaches visitors about the importance of water in South Louisiana’s landscape and culture, and how various species have adapted to thrive here. The magic of food, dance, and theatre will come alive on the terraced grass lawn that frames the open-air amphitheater. This jewel is nestled in the bend of the wetland pond and is surrounded by trees connected by hammocks for those who want to lounge. 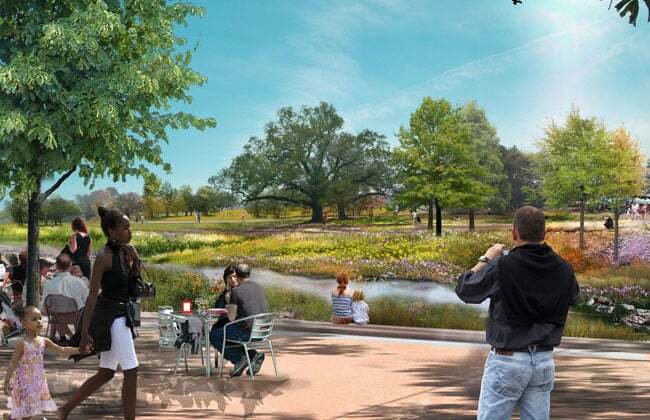 This spectacular new venue will bring life and nature to Acadiana’s vibrant culture. The stunning views and intimate setting will add inspiration to concerts, plays, and theatrical performances as the surrounding nature creates a perfect backdrop. Lovely flowers infuse the air with joy on the spiraling ascent to the top of our two-story garden-mound. This grandiose garden serves as a centerpiece and provides a magnificent view of the horticultural gardens, amphitheater, wetland pond, boardwalks, great lawn, iris garden, and Visitors Center. The park’s Visitors Center provides opportunities for botanical exploration, park orientation, community building, and learning activities. This spacious, open lawn is the perfect place to enjoy a little sunshine, run around with the kids, or enjoy a book in the shade of the promenade’s live oaks. 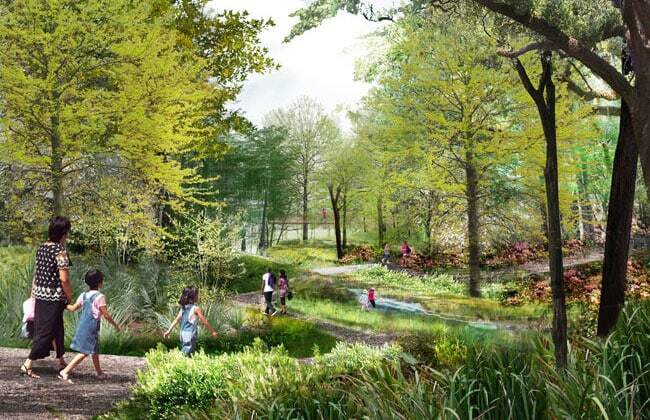 The park’s signature open space is bordered by the picnic beach of the wetland pond; the main park loop for runners, walkers, and cyclists; and the adventure playground, featuring climbing structures and tree houses that invite explorers into the natural canopy. Cooled by the shade of bottomland hardwood forest growth, this woodland garden will delight the senses with brilliant pops of color and long views through forested ravines. The world will transform before you as prairie blends into wooded valleys. These intimate pockets of quiet beauty can be enjoyed as you journey down the boardwalk, which leads you on an adventure to the open-air pavilion at each of the two ponds. Stroll through nature, peek in on the birds, and share a snack while resting on the cozy grass pockets that surround the small prairie pond. 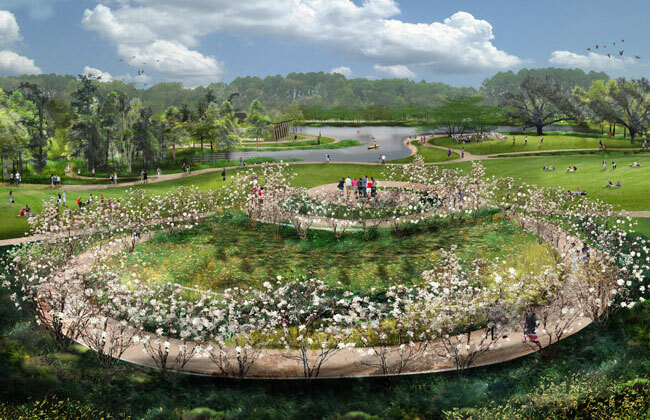 Peer across the small pond from the open-air pavilion and revel in the picturesque view of the rippled reflections of the prairie meadow’s Sculpture Garden. 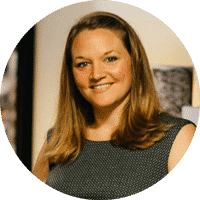 For more details on the programming and planning process we used to develop the master plan, please click on the button below to learn more! We are excited to move forward with our fundraising efforts and the development of phase-one construction.